This painting makes me want to run off and join the circus. Or join this band of quacks. Travelling from village to village, passing these landscapes and ruins. I’m also fascinated with the Scaramouche man in black, standing on tiptoe and stooping his head. He reminds me — obliquely, always obliquely — of Antoine Watteau’s L’indifférent picture. The colours are unfortunately not ‘true’. The original is much darker I presume. Perhaps more like this one. Concerning the true color of paintings online. Consider this for example. Notice how the colors vary? It’s impossible to find out the true color of the painting unless you visit the website of the museum where the painting is located. I wonder if Google Art Project has a policy? 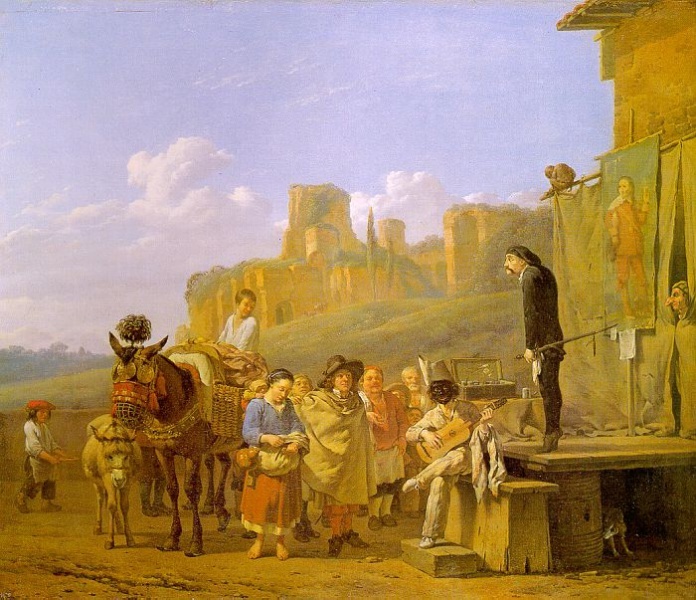 This entry was posted in Uncategorized and tagged circus, Karel Dujardin, painting, quakery on June 28, 2014 by jahsonic.